Our team of consultants have backgrounds in GIS, Engineering, Geography and Computer Science. We have experience of a broad range of application areas of GIS and can therefore bring innovative ideas for the application of GIS to new areas based on this experience. We can work with the client to develop ideas further, then take the project from initiation to full implementation. It is possible to achieve this while also benefiting the user by maintaining flexibility in our development, and in this regard we adopt a structured approach based on the industry standard Dynamic System Development Methodology (DSDM). Typically this looks at requirements and expectations in terms of MoSCoW rules, where each aspect is categorised in terms of Must have; Should have; Could have; Would like. As prototypes and testing evolves this is reviewed with the client to determine and address the priorities an limitations to ensure the delivery is on time and within budget. A core part of our overall business consideration is implementing a structured Project Management approach. We have evolved an effective system for GIS projects, based on significant aspects of the industry standard PRINCE method, where measurement is typically taken in terms of deliverables and checkpoints rather than processes and tasks. This system also includes flexibility to allow integration into projects managed on a consortium basis, where our activities receive or deliver inputs and outputs to other components of a project. Our team of consultants can offer full support and helpdesk facilities to ensure clients gain maximum benefit from their GIS implementation. Support is generally on a phone/fax/e-mail basis, with optional call-off days for further development or system health checks. Many clients opt for a Service Level Agreement with support and a number of days purchased up front. These days can be used for a range of tasks, and the client gains peace of mind knowing that this option can be called upon at any time to solve problems and issues. The client may also gain from cost savings through purchasing a block of days in advance. Contact us for the range of options available to suit your requirements. As with any software product or solution, a good grounding in its functionality is essential to gain maximum benefit from it. This enables users to reap full benefits when using the software on a day-to-day basis. GeoSolutions run a series of training courses, primarily in GIS, but also in other software products such as DOER. We are ESRI approved trainers, and have run successful training courses for many years. These cover both ESRI products, and also bespoke training courses on GeoSolutions products, or tailored courses for using GIS in a specific application area. We hold training courses either on-site, or at our modern training suite in Belfast. 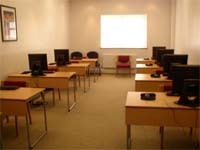 We generally cater for no more than 8 delegates, with each delegate having access to a high specification, networked PC. Our training facility is equipped with modern visual aids, and air conditioning for delegate comfort. Full catering is available on-site. Our training facility has ample free car parking, and is within easy walking distance of Belfast Central Station. Our prices are very competitive - please contact us for further information. Three day training course covering use of ArcView 3 for all aspects of the creation of development plans, including GeoSolutions extensions. Over 70 planners training over a 12 month period. Bespoke training courses based on ArcGIS with specfic focus on the military use of GIS. Bespoke training courses developed for High End FSGIS, FSGIS intranet, and custom course for the Private Woodlands team. Our consultants can help assess your GIS requirements and recommend the most cost effective implementation where appropriate. This can include data requirements, training requirements and any application development to streamline the workflow. Appropriate requirements may range from one or two GIS seats, to full enterprise GIS involving multiple users. Implementations may also include Inter/Intranet GIS, mobile applications and appropriate database and back-up solutions. Database development - SQLPlus, PLSQL and Access development.